It is stunningly beautiful to go through some old papers and suddenly run into old pictures and notes made over 10 years ago. This just happened to me last month, and here it is, the memories of the performance art duet ”O”. 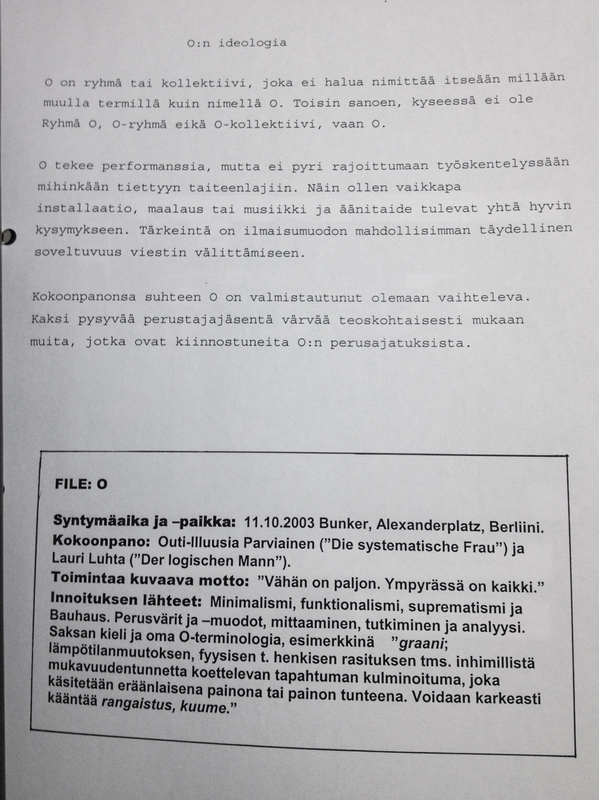 O (the letter O, referring to a circle as a never-ending and strictly geometric form) was an artist duo of me (known then with the name Parviainen) and Lauri Luhta. We would be known with names ”Die Systematische Frau” and ”Der logischen Mann”. We came up with the urge to establish O after experiencing several simultaneous geometric occasions in Berlin on October 2003, while performing solo and group works in International Congress of Performance Art, Gallery SoToDo. Being inspired by the authentic works of art in the Bauhaus Museum, the duo O started a series of performances including geometric elements in action such as drawing circles and squares, using pure basic colors according to Johannes Itten, and measuring/mathematics. The question was often much about nutritional experiments, too, like finding a suitable state of mind and body through kethosis, enjoying lots of caffeine or nutritional supplements, or fasting before the performance. The first performance in Berlin included feeding the audience with Schokoladenriegeln (chocolate Santa Clauses). The first performance was a collaboration with Morlokkiarmeija, which later came to be known as KOELSE, Kokeellisen Elektroniikan Seura (Association of experimental electronics). Later, some technological experiments were involved, such as wearing a 4-channel recorder attached to the body, and overlapping the recordings of nutrition and science based mind flow dialogue while moving on the floor only by lying on our back. In Taidehalli, Helsinki, you would also see Die Systematische Frau, eyes wide open, kneeled in front of a TV producing a static image, with her face attached to the screen with tape, as Der Logischen Mann would walk around a circle and make some measurements on KOELSE members with a measuring tape. The performances were named by numbers according to their appearance, so the first one would be ”0”, the next one ”1” and so on. Due to the short name of both the group and the performances, it would sometimes happen that the audience had a hard time understanding that O was the name of a performer. That is, of course, a typical thing to happen to a conceptual art maker, and also a part of the risky business of simplifying things to the ultimatum. INSPIRATION: Minimalism, functionalism, suprematism, the Bauhaus. Basic forms and primary colors. Measuring things, analyzing, research. German language.